Mars could return dividends at the same time that Luna does if they join forces. Luna has considerable potential for manufacturing and shipping goods into orbit about Earth where it can be of financial benefit, but Luna is short of Hydrogen, Nitrogen, Carbon, and Chlorine. These elements are not only necessary for life, they are useful for many industrial processes. Luna also lacks significant sources of Argon, which is useful for industry. Mars has all of these elements in reasonably recoverable concentrations, and could export them to Luna and Earth orbiting factories. It has been suggested that importing goods from Ceres would be more economical than importing them from Mars. However Ceres has shown no likelihood of having sources of nitrogen or argon. Without some source of inert gas making a breathable atmosphere or using some industrial processes would be impossible. People should consider getting from one place all of the raw materials needed to supplement the raw materials available on Luna. The cost of lifting items from Mars could become considerably less than the cost of lifting them from Earth. Low Mars orbit, at an altitude of 300 miles, has a velocity of 2138 meters per second, less than thirty percent of the velocity needed for low Earth orbit, more than the velocity needed to orbit Luna. With reusable rockets built on Earth to use liquid methane and liquid oxygen, there should be a large fraction of the take-off weight in orbit. With wings for a supersonic in ground effect landing in the 0.1 psi Martian atmosphere, the technical problems might be within human abilities. It is possible that a subsonic aircraft could be used to conduct reconnaissance on Mars, but for a cargo lifting shuttle the large wing area needed for subsonic flight is likely to be impractical. There seems reason to believe that supersonic in ground effect landing is a significant problem, and that it should yield to the proper effort, resulting in an economic Mars to Low Mars Orbit Shuttle (MTLMOS pronounced metal mos to rhyme with verbose). Donald Campbell was killed on the 4th of January, 1967 when the "Bluebird K7" racing boat flipped over and disintegrated at a speed greater than 300 mph. The problem seems to have been longitudinal instability when high ground effect lifting forces acted on a center of lift that shifted rapidly with changing attitude. Landing at a speed in the neighborhood of 1000 mph (mach 1.9 on Mars) might seem more difficult than the feat accomplished by "Thrust SSC," but moving through only 150th of the gas pressure (100th of the density) should tend to compensates for the increased speed. Maintaining lift and orientational stability are the problems for which we have aeronautical engineers, computational fluid dynamics, and wind tunnels. A skyhook is an interesting alternative both for Luna and Mars. Probably, it allows even more cost reduction. If the technology for the supersonic in ground effect landing is not ready soon enough, there is the possibility of mining Phobos. Phobos may be rich in volatiles, which are needed by Luna. Phobos could be ground up and processed at one end and the tailings dumped at the other end. It should be many years before the entire moon is converted into tailings, during that time Luna and Earth orbiting factories should be churning out a great many solar power satellites, orbital habitats, and orbiting space ports to help lift traffic from Earth. If Phobos is 30% by weight volatiles and ships six thousand tons a year that is part ammonium cyanide and part propane, then after fifty years 100 billionths of Phobos will be processed. Initial Martian settlements will have little industrial infrastructure, and will have to import many goods such as electronics and medicine. Lunar settlements are in a good position to supply some of these needs, as the energy cost of transport from Luna is much less than from Earth. Most of Mars' imports would still likely come from Earth. Like Lunar settlements, Martian settlements need funding to survive. 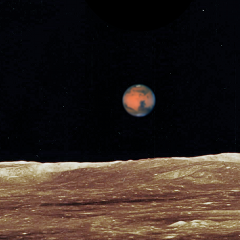 Sales of Martian resources to Lunar and other interests could be a major source of cash. Luna would get the cash from Earth for materials that go into space based solar power plants, habitats and other orbiting structures. To get goods from Luna to Mars, those goods could be launched from Luna with Mass Drivers (or other low cost per ton technologies) and transferred from Earth's orbital position to Mars with a VASIMR propulsion system. Each delivery could be packed with a one-time-use fiber glass composite heat shield and a woven glass fiber parachute. There would be no need to pack the parachute compactly for shipment. It would be woven in space from lunar materials. Some of the MTLMOS flights would be dedicated to launching refueled methane/oxygen retro-rockets for the final landing deceleration. The oxygen for the retro-rockets would be included with the shipments to Mars which would rendezvous at a space station to mate with retro-rockets while the VASIMR transport system would take a shipment to Luna. We cannot yet predict with certainty how efficiently hydrogen will be recycled in the ilmenite hydrogen process for producing oxygen so let us guess that one part in a thousand of the hydrogen goes out with the ilmenite tailings in every batch. We can guess that one part in a thousand of both hydrogen and oxygen gets lost in electrolytic separation of oxygen from the water to get oxygen into storage tanks. So starting with 1000 pounds of hydrogen we get 998 pounds of hydrogen and 7922 pounds of oxygen from running that hydrogen once through the process. If each 10 pounds of oxygen requires a pound of tankage, then at 20cents a pound to launch electromagnetically from Luna to L2 and 20 cents a pound to launch electromagnetically from L2 to low Earth orbit, it will cost $3486 to ship 7922 pounds of oxygen to low Earth orbit from Luna. At $17700 a pound for gold on Earth today or $17700 a pound for hydrogen on Luna, $35400 worth of hydrogen were used up making the oxygen. That compares to $79 million to ship the same amount of oxygen from Earth to low Earth orbit. We have not considered here the cost of making the tankage or the maneuvering system to recircularize the orbit of the oxygen tanks after they are captured in low Earth orbit by aerobraking and some other costs, but we can guess these costs will amount to less than the $78,916,114 by which the cost of transportation from Earth exceeds the costs that we did consider. The main point here is that even if hydrogen on Luna costs as much per pound as gold on Earth (a reasonable guess), it does not rule out the economic use of hydrogen in industry. Many factors will affect the economic success or failure of lunar industry. This oxygen delivered to low Earth orbit could be used for fueling colonization ships to Mars, used for shipping exports from Earth to Mars, used for industry in low Earth orbit, or used for transportation throughout the solar system. Money from the sale of this and any other exports could be used to pay for imports from Mars. The first attempted trade commodity might pay off, but certainly many alternatives will be considered. The value of economic expansion of humanity into outer space is a great prize to seek. Settlements on Mars and Luna share many needs and opportunities. Information such as patented ideas, literature, scientific research, and computer programs can be created and traded between Luna and Mars at little to no transport expense by radio. ↑ Phobos weighs 1*10^16 kg according to the Phobos article at Wikipedia. This page was last edited on 19 March 2015, at 23:27.